Care Divas is a disarmingly funny and candid musical drama inspired by the award-winning documentary 'Paperdolls'. 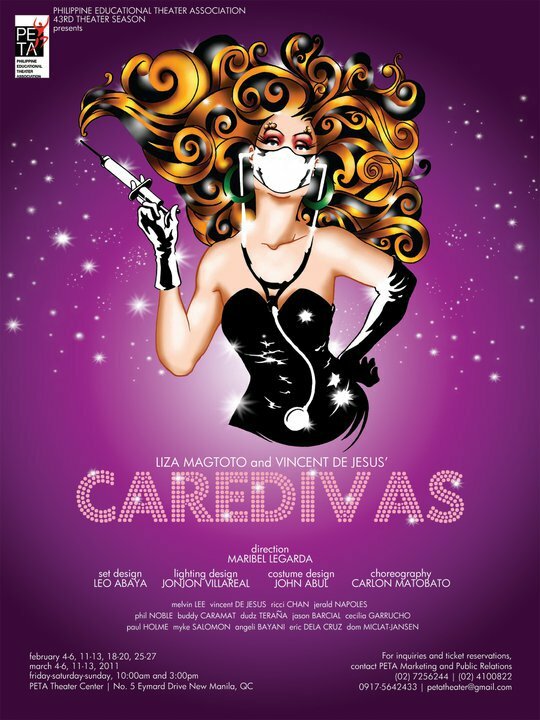 It is a story about five Filipino transgender migrant workers who have emigrated to Israel to work as health care providers for the elderly and who in their spare time, perform as drag queens. While desperate to make ends meet in another country, they also struggle to search for freedom and acceptance. Entertaining as it is, the play also demonstrates the generosity of spirit, resilience and humanity of Filipinos. The viewers will be treated to a limited engagement -- a night of music, laughter and explosive production numbers that will transport them to a remote Israeli Tel Aviv club, where daytime gay caregivers transform into fabulous divas at night. Care Divas follows the life of Chelsea (Melvin Lee), Shai (Vincent De Jesus), Kayla (Jerald Napoles/ Ricci Chan), Thalia (Dudz Teraña/ Jason Barcial) and Jonee (Phil Noble/ Buddy Caramat) - five Filipino Overseas Filipino Workers who each to make ends meet in another country while struggling to search for freedom and acceptance. 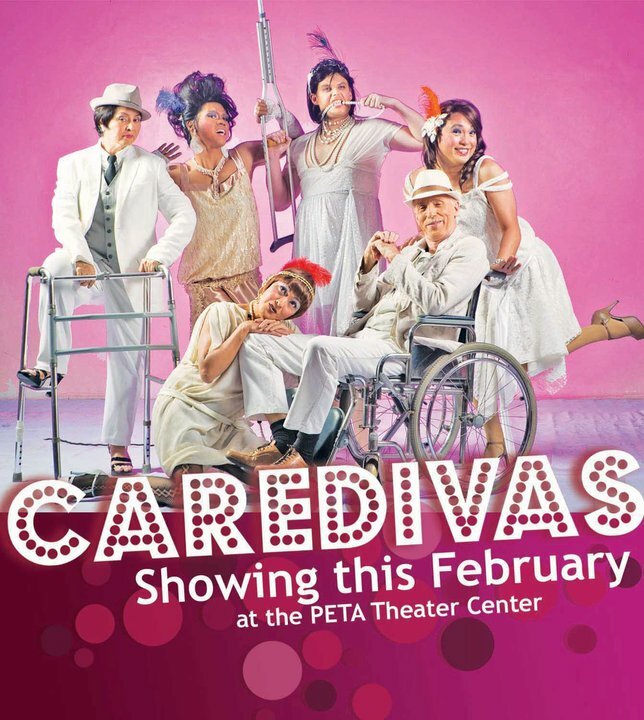 The Care Divas cast includes a powerhouse cast of theater actors: Cecilia Garrucho, Paul Holme, Myke Salomon, Miguel Hidalgo, Angeli Bayani, Eric Dela Cruz and Dom Miclat-Janssen. The creative team behind Care Divas are Palanca award-winning writer Liza Magtoto, multi-awarded composer Vincent De Jesus, prolific director Maribel Legarda, costume designer John Abul, events and theater lighting designer Jon Jon Villareal, visual artist and award-winning set designer Leo Abaya and contemporary dancer and choreographer Carlon Matobato. 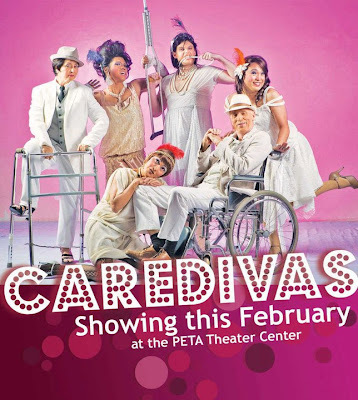 Care Divas is showing at the PETA Theater Center every Friday, Saturday and Sunday, 10:00 A.M. and 3:00 P.M. from February 4 - March 13, 2011. For inquiries and ticket reservations, contact PETA Marketing and Public Relations Office at (632) 725-6244, (632) 410-0821 or +63917.5642433 or email at petatheater@gmail.com. Hi Beth! It's still best to contact them regarding coverage, etc... Good luck!